Southern right whales, hunted perilously close to extinction last century, appear to be making a remarkable recovery in New Zealand according to recent research. 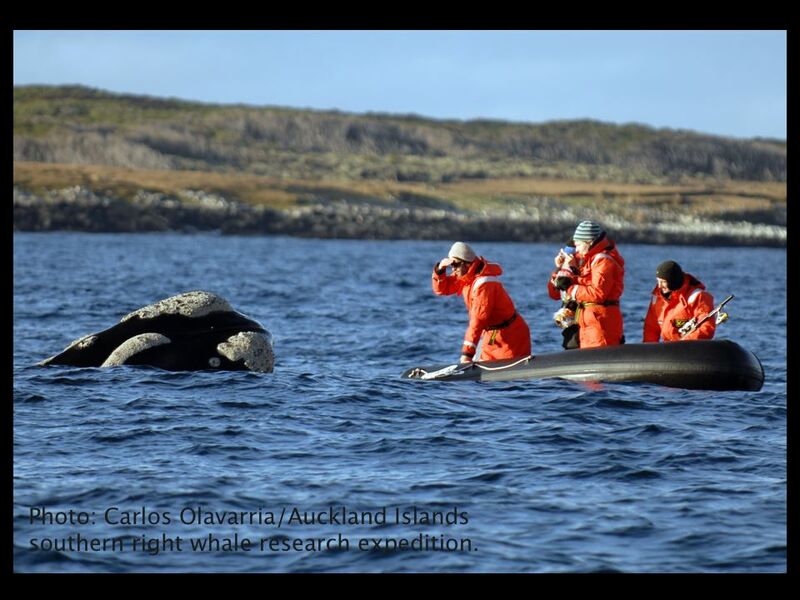 For the past four years a group of scientists from Auckland and Otago Universities, the Department of Conservation and the Australian Antarctic Division have been sailing south to the Auckland Islands to count and identify individual whales that go there to breed and calve. 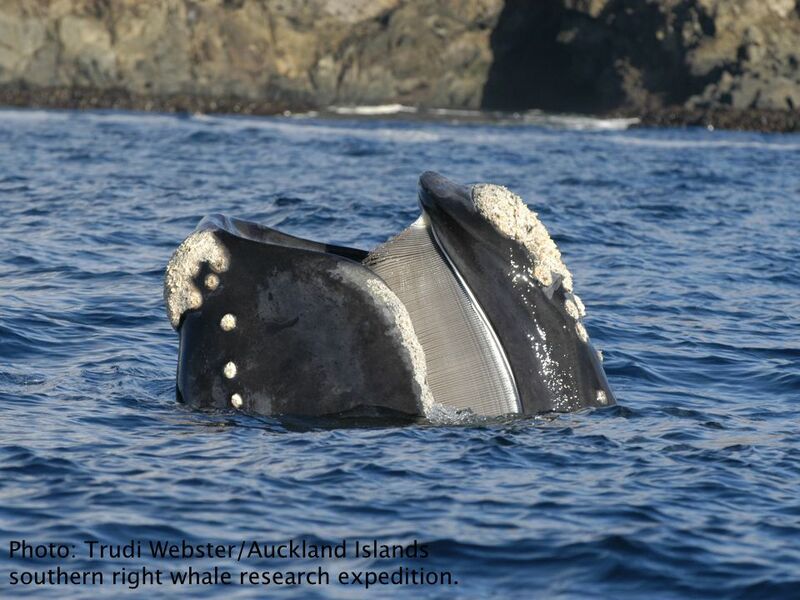 Recent DNA matches of whales recorded in both the Auckland Islands and mainland New Zealand have shown that the animals migrate between these two areas and likely form one intermingling population. Certain individuals have also been seen at the Auckland Islands, Campbell Island, mainland New Zealand and South Australia — these animals certainly get around! The research group sails to the Auckland Islands on the R.V. Evohe, and then conducts surveys from small boats. Here they are in Port Ross. Individual whales are able to be identified by unique markings on their skin. These white patches are aggregations of crustaceans, called cyamids, which cluster around skin calluses. These patches of cyamids remain remarkably consistent year on year. 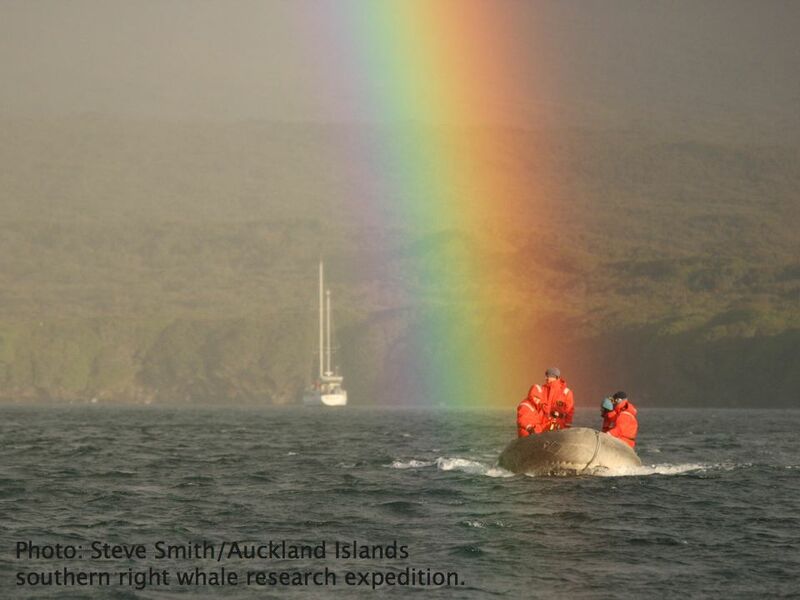 Results of genetic analyses by Professor Scott Baker and his team at Auckland and Oregon State Universities indicate that the New Zealand population of southern rights was reduced to as few as 50 reproductive females following years of hunting in the 1800s and early 1900s, and further illegal whaling of the species by the Soviet Union in the 1950s and 60s. Since the 1960s the population appears to have been steadily increasing. Ten years ago the population was estimated to include about 900 whales, and the preliminary findings of the latest surveys, indicate that numbers have likely doubled since then. 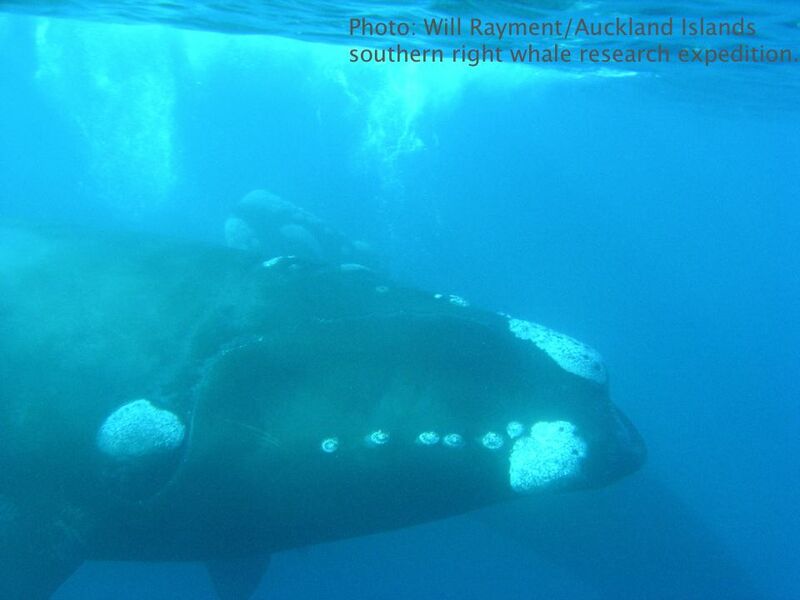 According toDr Simon Childerhouse, the leader of the most recent expeditions, the rate of recovery of New Zealand southern right whales appears to be at least as high as that seen for populations in Australia and South Africa. In contrast, populations of northern right whales are incredibly depleted, and do not appear to be recovering. Despite right whales being protected in the northern hemisphere, mortality from ship strike and entanglement in fishing gear appears to be outweighing natural population increase. In this sense, southern right whales are fortunate — their natural home range around the Southern Ocean and coastal and offshore New Zealand, has relatively low volumes of shipping traffic. 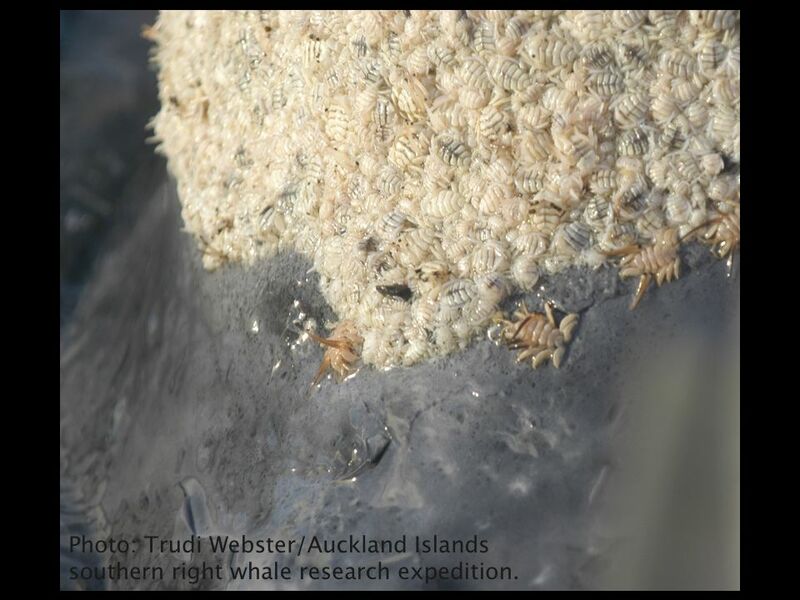 Southern rights are baleen whales, and feed upon zooplankton such as copepods and euphausids. 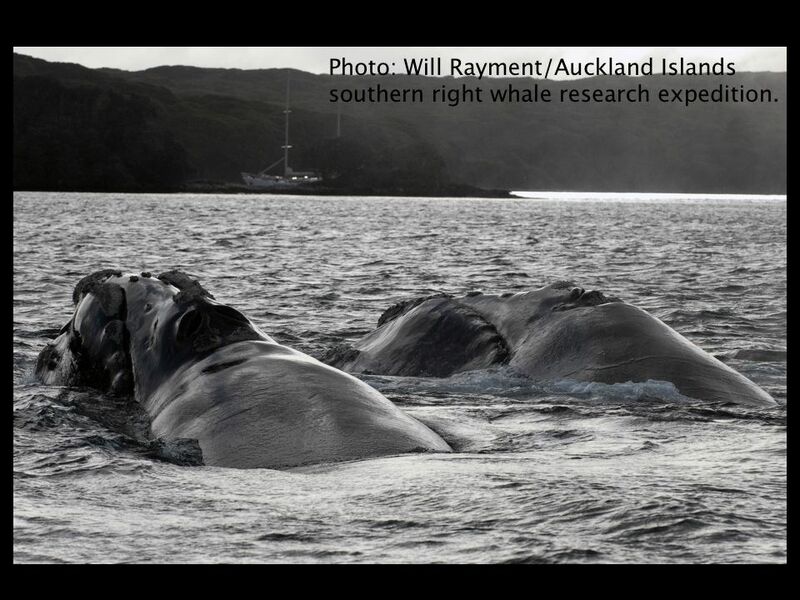 Two southern right whales, with the R.V. Evohe anchored in the background. These days, Port Ross at the northern end of the Auckland Islands, is the main breeding area for New Zealand southern rights. The whales congregate there in large numbers throughout the winter months. Dr Rayment says that there may be up to 200 individuals in the harbour at any one time, and all evidence points towards the species being highly promiscuous. During the latest trip to the Auckland Islands, it was common to see several males pursuing a female, with the female often rolling on her back in an effort to stop males from mating with her. Following a one year gestation period, females tend to return to the harbour to calve, and then spend a year nursing their calf before conceiving again — resulting in most females producing one calf every three or four years. The increase in whale numbers appears to be following a typical exponential population growth often seen in recovering populations. And the increase is starting to be noticeable in mainland New Zealand — numbers of annual whale sightings recorded by the Department of Conservation are trending upwards around Otago. The current population is estimated to be only 10% of the pre-whaling numbers, suggesting that we may well be visited by a lot more southern rights in the future. In these times of doom and gloom for the marine environment (think depleted fish stocks, marine pollution, ocean acidification…), it is uplifting to see a species making a comeback. Southern right whales often approached the research vessels during surveys. Last year the expedition was joined by a journalist and a photographer from National Geographic — theresulting underwater photographs are truly awesome.